Subscription and ticket sales cover less than 60% of the budget required to create the props, sets and costumes you see on the Alley stages. We need contributed support from individuals to continue the behind the scenes work that brings our shows to life. Our end-of-season campaign goal is to raise $180,000 by June 30, 2017 to help support all of the hard work, skills and materials needed to create magic on the Alley stages! 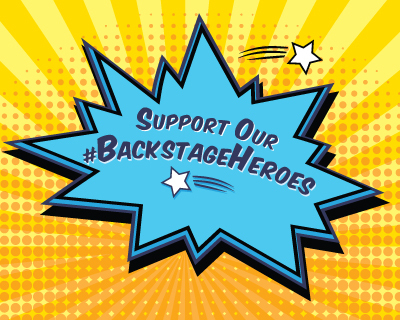 Learn more about our Backstage Heroes and the campaign here. As an Alley Ambassador, you can be a behind-the-scenes hero, too! All we ask is for your help spreading the word about our campaign to help us fundraise for the final end-of-season sprint! It will only take a few minutes, just a few mouse-clicks can already make a huge difference. Share the Impact of Your Gift pages! Share the #BackstageHereos Campaign brand with your friends on Facebook. Instagram this fun #BackstageHereos graphic. Direct your friends to our online donation form or to our Backstage Heroes website to learn more our heroes and the impact of donations. The Alley produces up to 14 plays a year with a full-time staff numbering nearly 200. All of the productions we mount are built and rehearsed on site. Our Center for Theatre Production is comprised of 75,000 square feet of shops specializing in scenery construction, costume construction, properties, wigs, lighting and sound design. Our rehearsal studios, workshops, large costume collection, and administrative offices are all also onsite at our downtown location. The Alley Theatre reaches over 200,000 people each year through its performances and education programs. Our goal is to produce the highest-quality of theatre that continues to entertain, challenge and inspire our audiences. View the impact of gifts here.